Back in December I was invited to be featured in Alba Botanica's first ad campaign, called "Do Good. Do Beautiful." The campaign would celebrate five women making a difference in the world through their work in areas of community service, activism and social cause. When the agency representing Alba reached out I was instantly intrigued because it's a brand I already use (I've been using their Aloe & Green Tea Oil-Free Moisturizer for years), and because of their intention behind the campaign aligned with my values. Our initial meeting, a Google Hangout with six of us present, was only supposed to be about 30 minutes long—instead it went a little over an hour. It was basically an interview to see if the collaboration made sense, but it didn't feel like an interview. There was great energy and we had a great conversation. Regardless of the outcome, I walked away from that meeting feeling revived because it was a great reminder of the work I'm looking to do and it was simply nice speaking with some inspiring creative people. So I was in fact selected to be one of the ladies that would be followed for a day sharing my story as an artist on the go. From working on a lap-top in a hotel room to creating on an iPad in a coffee shop they offer a glimpse of what it's like having the world as your studio and creating work with a mission to inspire others with my artwork. We shot for a full day with make-up at 6:00 am in my hotel room and a wrap at 5:00 pm on a chilly beach in Santa Monica. I'm super happy with the final video. There was a lot cut from the final footage so I wanted to share a few fun outtake photos. Me "working" in the hotel room. It was fun rolling around that comfy bed for a few hours. Taking a coffee break and catching the sunset in Santa Monica. And here is the video. Please be sure to check out the other four ladies here. They all have inspiring stories. "What took you to Sweden?" This has been a common question lately whenever I mention my frequent trips to Stockholm in the last year and a half. My response is always, "Love." In 2015 I went on a coffee date that turned into an evening of appetizers, happy hour drinks, and dinner. Our conversation flowed from one topic to another as we bounced down a happening street. We were together for seven hours. I was instantly smitten. And it was all so unexpected. He's Swedish and was on vacation visiting the states. When we connected I thought, "Oh it'll be fun to just link for coffee. Who knows what'll happen." Fast forward nearly two years later we are together and I am officially a permanent resident of Sweden. An expat. An immigrant. Eventually taking steps towards citizenship. But for now I am adjusting to life abroad, which means navigating a new country and systems while learning a new language and culture. In addition to running my creative studio AND nurturing a newish romantic relationship. Although my empathy for the immigrant experience existed long before this, because of my life with an immigrant mother, this new chapter has already given me a deeper level of appreciation and understanding for what it means to leave everything you know and start over. Like getting lost in a city and not knowing how to say the street names, buying produce (weighed in grams instead of pounds), and sometimes feeling left out of conversations because I don't yet speak Swedish. The transition does come with it's challenges but for the most part, I have it pretty easy. I can't even begin to imagine what's it's like for a newcomer who doesn't know anything about the language, culture, or systems they are about to be thrown into. Sweden is probably one of the most easiest non-English speaking European countries for an American to move to. Most folks here speak English! Although there are many cultural differences, there are tons of similarities and familiarities. I can find most products I use at home here, all the magazine shops have publications in English, and because of its diversity you can find food from everywhere—which reminds me of home. Whenever I feel frustrated or confused, like a brief moment today when I ventured out into sub zero weather taking the bus alone for the first time to find the building where I needed to register for a personal identification number, I remind myself that 1. it's not that hard (it's ok to be a little lost), 2. people do this every day, 3. I'm smart, I can figure it out, 4. I can always ask for help, 5. I live somewhere new, which is super amazing! But in those moments what I think about the most are those courageous people who leave home (and everything they know) to come here or any other place in the world and just figure it out. They raise families, work hard, start their own businesses, learn a new language, take care of family back at home, and most of the time do it without having the support of family and friends nearby. And until recently doing so with little communication. Let's not forget, Facebook, WhatsApp, Viber, and Skype are all new! Before, folks depended on super expensive calling cards or long distance phone calls, both of which limited how long you could chat. Technology has made it easier for us living far away to stay close. Which I will definitely need. So here I am. On a new adventure. I'm excited to see how this all unfolds, but most importantly taking it in day by day. And remembering that I'm in love! And I get to live abroad! Something I've always wanted to do. So happy to share that I am the November Geenie for GeenieBox! GeenieBox is a new startup of monthly curated boxes by iconic black women. Each box features books, lifestyle products and exclusive experiences with the purpose of inspiring ambitious women to live richer, more rewarding lives. My November box theme is "Being You" - in keeping with the self-discovery and creativity work I have championed through my recent books, I Love My Hair and Becoming Me. Sign up 10pm EST on #CyberMonday (11/28) to receive my box and for a limited time only use promo code: ANDREA to receive 20% off! More info here. Photo by Danielle Finney, illustrated interpretation by Kim Salt. This last week since the launch of Becoming Me has been phenomenal. The first signing was at a Barnes & Noble in my hometown (a big thank you to all who came out). Next I was off to Stamford, CT for a talk about writing down big dreams with 65 teens at the Ferguson Library. Then I had the honor of speaking at my alma mater, Tyler School of Art—which was totally surreal because as I was standing there I remembered being on the other side, a design student learning from the speakers who visited. It has been such a treat to connect with people who have supported my work over the years, and being able to share my story with young people. Here are a few photos from the events. The book tour road trip officially starts next Tuesday with my first stop in Detroit at Tulani Rose. It's my first time in the city and I can't wait! For the event RSVP here. Visit my book tour page for more information on upcoming events in Chicago, Oakland, and LA. I hope to see you soon! Everyone is creative. We express our creativity in different ways: how we organize our home, cook for our families, or design our gardens—our creativity comes out in as many unique ways as we are individuals. The trick is to recognize and nurture it, to own that special "thing" that is ours alone. Whether it's about starting a new venture or just taking time to yourself, it's super important to give ourselves time to be creative—which ultimately leads to us being fully ourselves. That was the thinking behind Becoming Me. It's my latest project with Random House and another iteration of my work to inspire creativity. I Love My Hair used coloring and doodles to share my excitement about hair and art. And to get readers excited about playing with color and getting their hands dirty with drawing. Becoming Me takes it a step further. With tips, tricks, exercises, and yes a bit of coloring as well, I was looking to create a resource to encourage readers to live a creative life. Even if you're not a visual kind of creative person (painting, drawing, etc. 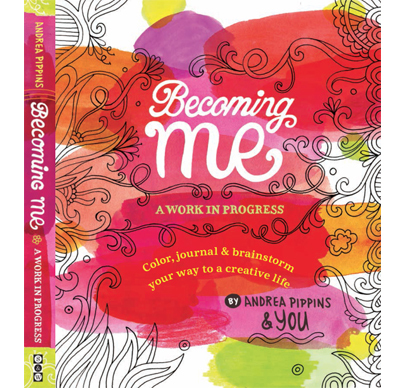 ), Becoming Me is a great space for collecting your ideas and inspirations. It also shares techniques for generating new concepts and capturing your thoughts, all of which is necessary for any creative process. I'm truly excited about this new book because it brings together a lot of what I've learned as an artist/designer and as an educator. You can use it for yourself, with your kids, and at work with your colleagues. Becoming Me comes out October 11th, but is ready for pre-order now. Let's go on this creative journey together. Keep checking back here for sneak peeks and updates. I'll be sharing some supplemental tid-bits for the book here as well as on Instagram. And show me what you're working on and creating. I would love to see regardless if it's related to the book or not. I want to see your creative space and what you're working on. Tag me and/or use the #whatIcreate or #whereIcreate hashtag. I can't wait to see what you're doing! I'm excited to share that I will be at the Studio Museum in Harlem this Thursday (7:00-8:30 PM) sharing a brief discussion about I Love My Hair and signing books. If you're in the area come through! Books will be available for purchase. Make reservations at museumstore[at]studiomuseum[dot]org (encouraged but not required). Hope to see you there. Most of January was a month of rest and rejuvenation. I spent the entire month in Stockholm, with a brief stop-over in London, and literally slept for the first two weeks. I was beat. But it's February (my birthday month — cheers to another rotation around the sun) and I'm back in Baltimore ready to get things popping. What does that mean? New projects, including book number 2!! !, and committing to my creative practice even more. And I'd like for you to join me. With love day upon us I thought it would be fun to work together on nurturing something we love doing creatively. Sometimes we neglect the very thing that inspires us and brings us so much joy. So here's an opportunity to give your creativity some love. Whether you're a full-time designer, a dancer, or just want to get motivated to create something this 14 day challenge is for you. Here on Fly and on Instagram (starting today) I'll be sharing exercises and info I've learned over the years as a designer/illustrator and design educator. These are all tips and tricks (and some reminders) that I use when I feel stuck or need a new perspective, and some that I use when working with my design students. What do you need in order to participate? Just visit here or follow me on IG at @andreapippins daily to see the prompt for the day, and set aside a few minutes a day to flex that creative muscle. I will be posting more in-depth posts here to supplement some of the info. We'll be using the #iamcreative hashtag to document the progression of the days. If you feel comfortable enough to share your experience please use the hashtag if you post images. I'd love to see what you're thinking. What is that one thing you love to do and wish you could do every day, even for a few moments? Drawing, singing, cooking, painting, sewing? Sometimes we think we can't do it and then make excuses that keep us from our creative passions. For example, not having time or "I'm not creative enough." Honey, that's fear talking. Five minutes less on social media or 30 minutes less watching TV is plenty of time. And not creative enough? How do you really know unless you nurture it and let it grow? When you write down the 3 things that you think are stopping you let those inspire the things you can do to make time every day for a little creative expression. And then do them. Happy 2016 + I Love My Hair in London! Happy New Year! Wow can you believe January 2016 is already here? This last year was super busy for me. I had been going non-stop for 12 months straight. Then autumn hit. And it was a whirlwind with the launch of I Love My Hair. Between working on other projects and teaching, I was juggling a plethora of press features and traveling to book signing events up and down the east coast. It was a busy time but a lot of fun. By the end of December I was too tired and still too busy to sit and reflect as I usually do during the end of the year, so I'm now using January to relax, process, and take in all that I have done and learned during 2015. Despite feeling tired, at my core I am energized and inspired, and incredibly grateful. With that I'm ready to dive into the new year. 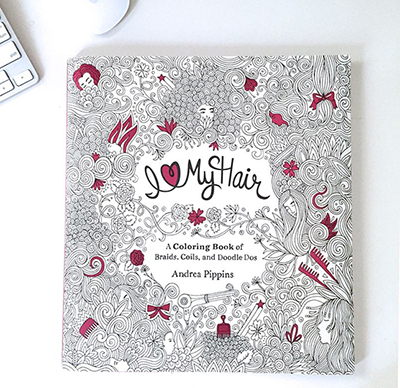 This year kicks off with an I Love My Hair book signing event in London! Join The NuBLK and myself on Saturday, January 23 | 2-4pm for an afternoon of colouring (yes with a "u"!) and mingling. Get your tickets here. I'm thrilled to continue promoting the book while starting new projects and making time for self-care. What about you? What are you excited about for 2016? Hope to meet you at any of these events!